The magnets have 4 north poles and 4 south poles and are strong enough that the sensor can detect the poles from more than 3mm (1/8inch). This means that the sensors do not need to be precisely mounted to detect the poles. The rubber hubs will press fit over most small motor and drive shafts used in low power gearboxes. A small screw may also be used to attach the magnets in some cases. The hall-effect sensors will work on voltages from 3V to 24V and include reverse polarity protection. The open drain output, when fitted with an external pullup resistor will drive any logic circuit from 3V to 24V and can also drive a LED or any other small load less than 25mA. 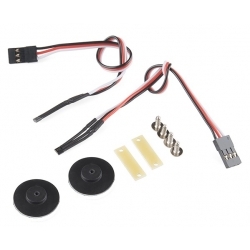 These sensors can connect directly into any compatible microcontroller board and use the processors internal pullup resistors eliminating the need for any external components or wiring.